What Do You Do When You Have a Flat Tire? What do you do when you have a flat tire? When you drive there is always a possibility that you will encounter a flat tire, that's why before driving one of the items that is necessary to check is the tire including the spare tire and the tools use for replacing a flat tire. If your car encounters flat tire here is what you do. Installing a car battery is something that every car owner should know. It is not that difficult to install a car battery since it is something that every able person can do. So, how to install a car battery? Step1. Boost charge the wet batteries to ensure top efficiency before installing. Step2. Clean first the battery terminal posts thoroughly with a wire brush, remove any corrosion that already accumulates on the battery pole. Ensure that the terminal post is free from corrosion. If you can make the metal shine then it is better. Step3. Turn off all lights and accessories that use electrical power. By doing so, it will minimize the possibility of sparks while installing the battery which may possibly cause short circuit. Step4. Observe and inspect all the lights if there is one that fails to turn off because if there is one lights that always keep on, when the battery is replace with a new one it will possibly drain the new battery. The Tire thread life could reduce if the Tire pressure of your car is under what the car manufacturer specified on your car owner’s manual. Aside from reduce Tire life it is also believe that having lower Tire pressure could also reduce fuel economy and to prevent those from happening it is necessary to check the Tyre pressure of your car for at least every month. 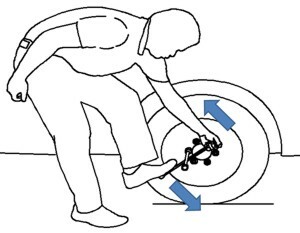 When checking for the Tire pressure, do it after running for about 1km. When you have a car it is important that you have knowledge with basic car maintenance like this simple step on how to replace windshield wipers. Windshield wiper is often use for cleaning the car windshield for any dirt or water when driving under the rain so that the driver have clear vision on the road and the front of the car. There are times that even though we used wiper to clean the windshield, still the windshield is not clear enough to see what is in front of car. To recharge a car battery it must be done on the same as it was discharge. Before attempting to recharge car battery always make sure that the battery is at room temperature (60 °F to 80°F). Also, when it is extremely cold remove the battery from the car and bring it indoors to allow the battery to become warm before begin the charging. Do you know how to disconnect a car battery? Which battery cable should be removed first? let's say you need to clean or replace the battery so you disconnect the battery to make the job here is what to do. How to jump start a car battery if car wont start because of a dead battery? Jump a starting car is easy but should be done correctly so that accident such as a battery explosion can be avoided that may result to the damage of your car or worst injured you. If you jump start a car, avoid the use of frozen battery. Also, check the battery rating of each battery for correct rating before jump starting. Step by step do it yourself easy to understand basic car maintenance for the car owners. How to Install a Car Battery While engine is running, use the meter to check the alternator and voltage regulator output. This is very important because a faulty alternator or voltage regulator can cause a premature battery failure and you do not want this to happen. How to Check Tyre Pressure The tyre thread life could reduce if the tyre pressure of your car is under what the car manufacturer specified on your car owner’s manual. How to Change a Flat Tire When you encounter a flat tire while you drive your car the first thing to do is to pull off the road away the traffic as possible. How to Recharge a Car Battery Before attempting to recharge car battery always make sure that the battery is at room temperature (60 °F to 80°F). Also, when it is extremely cold remove the battery from the car and bring it indoors to allow the battery to become warm before begin the charging.